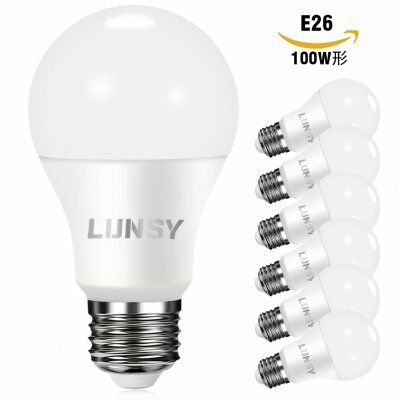 Successfully Added 6 Packed A19 LED Light Bulb, E26/27 Socket Bulb Non-dimmable to your Shopping Cart. HIGH EFFICIENCY: The 11W bulb is equal to 60W normal incandescent bulb which can help you save about 80% electricity bill. ECO-FRIENDLY: The bulb adopts no mercury and includes no UV/IR light. Certificated by CE, FCC and RoHS. LONG LIFESPAN: Can be used for about 25,000 hours, longer than traditional halogen bulb. EASY TO INSTALL: Standard A19 shape light with Edison medium screw E27/E26 base that can fit well into most lamp holder. APPLICATIONS: Kitchens; Living Rooms; Dining Rooms; Bedrooms; Hallways. Give off natural and comfortable 5000K daylight white light with 1000LM that provide bright illumination for an entire room.